Kay offers a discount of 50% on their first / introductory lesson! I am an experienced violin/fiddle teacher, qualified with a PGCE (Primary Education), and a BA (Hons) in Performance. I have experience of teaching adults and children alike, whether it be for exam preparation or purely for enjoyment. 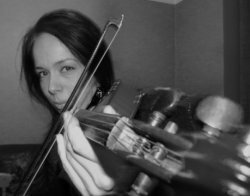 I currently work as a Project Musician for The Sage Gateshead, where I teach fiddle to adult beginners, and also as a Primary school teacher. I have taught one to one and group violin lessons in the UK for nearly 10 years, seeing many students grow and flourish into confident musicians over this time. In 2015 I was fortunate enough to work in Thailand where I taught fiddle music to Burmese refugees in Mae Sot Refugee Camp. Since returning, I have worked as a Primary School teacher at West Newcastle Academy, where I am their Music specialist. My lessons are fun and engaging, bringing out the best in students and individually tailored to their learning style. I teach a variety of musical styles and techniques, but have particular skills in folk music (English, Scottish, Irish, European and American). I play for the The Sage Gateshead, and am part of The Hot Stotties band, playing Americana/gypsy jazz fiddle. So, whether you are looking to pick up a violin for the very first time, take a grade or improve your technique, please get in touch.